Fiona Suwana is a PhD candidate at Digital Media Reseach Centre and research assistant at Queensland University of Technology (QUT). Fiona has been teaching in Indonesia and Australia. She has been a guest lecturer, researcher, and sessional academic at QUT. She was graduated from M.Sc of Communication Science at Universitas Indonesia and B.A (Hon) of Communication Studies at London School of Public Relations, Jakarta. Also, Fiona is an active member of QUT’s Digital Asia. 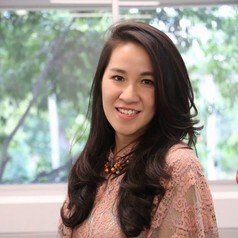 Her work has been published in Social and Behavioral Sciences and Kasestsart Journal as her research interest are digital media, digital media literacy, digital activism, democracy, Indonesia, policy and young people.